Ken and Julia came to visit us on NB Lillyanne today to get the ball rolling on the layout for NB Oleanna. They had with them some basic sketch plans and some hand drawn visuals of parts of the interior for us to look at and discuss. It is quite a while since we met with them in Sheffield which meant that we needed to retrace our steps a bit. We worked our way from the stern to the bow talking about layout. With still quite a few decisions to be made we couldn’t pin the layout down totally today. The main decision would be on the bow of Oleanna. When we had gone to Sheffield for the open day we had seen both Traditional bows and Josher bows. The trad bow is a lovely shape, but the Josher is beautiful. But beauty costs, an extra £4,000 and another foot of boat length at least. Trad bows are 9 ft long, Joshers at least 10 ft but better if 12 ft. At Meeting 1 we had decided to go for a Josher, adding 6 inches to Oleannas length which would help inside but not hinder us in short Yorkshire locks. Having lived on board NB Lillyanne now for 18 months we know how we live on a boat and how much space certain areas need. The galley is important and living on board full time requires for me a fully equipped kitchen. We eat out once every so often, but I enjoy cooking, so space for ingredients (including winter emergency stocks) is needed. So the plan of the galley needed re jigging. Ken had given us a bulk head and door between galley and dinette, this wouldn’t suit us. When people are visiting it’s nice to be able to chat to them as you cook or make drinks. Being able to see down along the boat also helps keep the boat open and appear more spacious. So an extra full height cupboard was discussed to be added to the back of the galley by the electrics cupboard. On Lilllyanne we have a small cupboard at the end of our galley high up above a worktop, but I find it impossible to reach the top shelf of this, so a cupboard that you can stand in front of would be better. White goods were discussed. A double oven (although there are not many LPG options available), 4 ring hob, a +++A rated fridge, a dishwasher. Originally we had looked at draw dishwashers, as we have one at home, these have a smaller capacity to the slimline ones, but are wider, however the space below one could be utilised elsewhere. But the difference in price between the two is quite large, saving a few pennies here and there may add up to a reasonable saving or money towards something else. On our first visit to Sheffield we had changed our mind from a Pullman dinette to an L shaped one. When I have work to do I need quite a bit of space and being able to stand as I model make means that an L shape would work best. It also opens up the space more. Somehow Ken must still have had our original spec where a pullman was mentioned. Both options take up a very similar amount of space so this had no effect on the general layout. Saloon, well that is where everything gets squashed somewhat. We want somewhere to sit and relax, a stove, hopefully that I can cook on, possibly a back boiler, and some shelving for books. At Oleanna’s current length this area is very tight, a sofa bed an impossibility. So various options were talked over. A more comfortable dinette where we could sit to watch TV, chairs, a sofa with out a bed. The most people we have had to stay has been three, my nephew being one of them, he could sleep on a blow up mattress or the floor. Having a sofa where one person could layout lengthways might be possible, so more thought there. Bathroom. We have made the decision to have a composting toilet. Various reasons, not having to empty a cassette every couple of days is one, the other £15 a time to empty a tank and the timer might run out on you all adds up. The idyll of your waste composting and you being able to dispose of it in nature doesn’t quite work on a boat, but visiting an elsan every six weeks for free is attractive. This means that as long as the toilet can be vented it can go anywhere and isn’t reliant on water or holding tanks. Shower, towel rail, and a sink just need positioning so the toilet can’t be seen whilst eating tea at the dinette. Having a cross bed gives us back 18 inches that an in line bed would eat up. The best solution for the layout is still our original from about three years ago. Many things have changed with Oleanna since then, but not this. I had made a 1:25 scale model so was able to show Ken and Julia our solution. Adding the areas up we were still extreamly tight. A compromise on either the interior or bow is needed. Then discussions on a Travel Power were had. Mick is of the opinion that Travel Power is the way to go when you have a washing machine on board (in the bedroom). Ken talked through the different options for power, a generator, working off the 3KW invertor as Travel Power is nearly as expensive as an engine. Then the numpty/girlie button discussion was had. Ken is of the opinion that electric bow thrusters are not worth the money, they run out of power quickly and charging the battery is problematical. Hydraulic is the best but costly and do we need it anyway. However having said that he is of the opinion that having a boat built you should have a bow thruster tube installed for future. We wouldn’t use it often as some do, but in emergencies it would be good to have. Julia gave me some websites to look at regarding finishes for the galley, bathroom and furnishings and a link to some radiators for us to look at. We have quite a lot of homework to be getting on with. The drawing equipment will be out and new versions drawn up over the weekend until we are happy with what we have, hoping that we haven’t done anything foolish with the plumbing. The hope is that we can finalise the layout in the next two weeks, at that point CAD drawings will be done and then Jonathan will slot the hull into his build schedule. We have mentioned that we would like to be in Sheffield for the base plate being laid. I have a feeling there will be “The” photo of us standing on it before work is commenced. This entry was posted in Uncategorized on 23rd Jan 2016 by pipandmick. 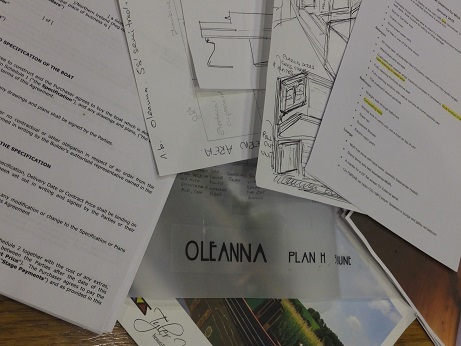 Tis exciting this narrowboat planning and having it built just so.So the final length is?